Welcome to my felted textured hat workshop. You will learn how to create a soft well draped, beautiful and high-quality felted hat, create a smooth and textured decor with the help of fibers, yarns, nepps and even finished felt. You will learn how to style and shape the hat in many different ways. This workshop is not suitable for a complete beginner. 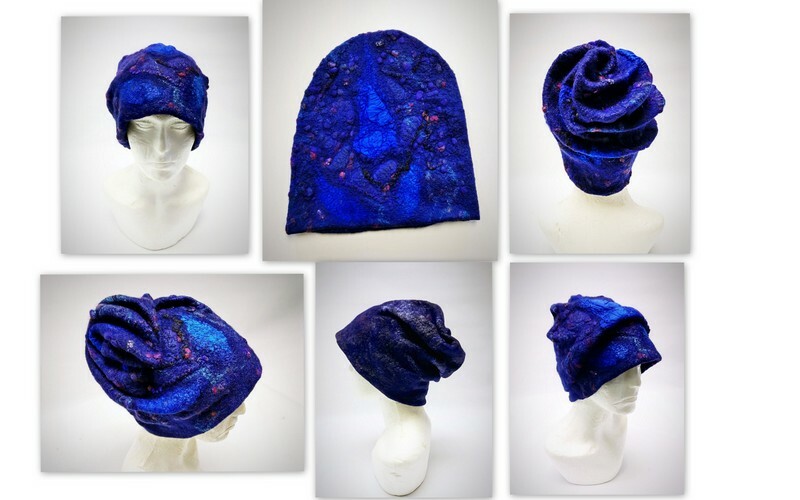 You will learn how to create a soft well draped, beautiful and high-quality felted hat, create a smooth and textured decor with the help of fibres, yarns, nepps and even finished felt. How to calculate coefficient of shrinkage and build a hat pattern to create seamless well fitted hat. You will learn non traditional felting technique called fibre lamination which is very popular amogst Eastern European feltmakers. It allows to create a soft, light, well draped, easy to stretch felt which also keeps shape well and as a result is widely used in making of felted clothes. The technique of fiber lamination makes it possible to create two-sided hat, changing the style and image. I will provide light refreshment and main materials necessary to create a hat. You will need to bring the following materials if you have. However, please do not worry I will have majority of materials. We will be using sander just for 5 minutes to speed up the felting process. If you have a sander for felting, then it would be great if you brought with you. This technique involves not just wool but also other fibres which is much easier to felt with the little bit of help from sander. If you prefer not to use sander, then I will show techniques to avoid it.